March Madness has begun! I’m hoping my KU Jayhawks go far in the tournament. Final 4 or bust! I recently read John Ruhlin’s book “Giftology”. This short book was on the art and science of using gifts to cut through the noise and clutter of life to open conversations, generate referrals and boost sales revenue. For you skeptics and cynics out there, when was the last time you received a knife from a prospect? Well then, I rest my case. 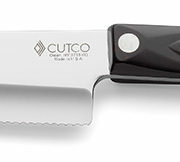 You can get a classy knife from Cutco, embroidered and gift wrapped for around $100 or so. Is this idea for everyone? Of course not. BUT, if you have a high average sale price, send out a few to some hard to reach prospects, and follow up later on by phone or email. Just one new client will probably pay for this investment. Is this guaranteed to work? Is anything? Of course not. Try this different way to get into the door of hard to reach executives and let me know how your results are.